Can be made from Stainless or aluminised steel in press bent or mandrel bent. 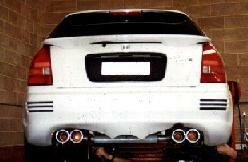 Sport Systems are made from a larger diameter tube and free flowing mufflers which improve gas flow and performance. * Engine works more efficiently. * More power and torque. * Sporty sound customised to your taste - Quiet, Sporty, or Loud. We only use the Best Quality products in our systems. All our welded joints are "fully welded" - we don't use putty. We check our sytems to ensure they do not leak or rattle. Our Custom Mufflers weigh up to 1kg more than an "off the shelf" type muffler and makes our V6 systems sound more like a V8. On 4x4's these custom mufflers are virtually indestructable. Our Stainless Steel mufflers are made from grade 304 Stainless Steel and have a 10 year Warranty.